As you may have noticed, Long Tail Pro Cloud has gone live along with a snazzy new website homepage. Many of our existing users are wondering when they might get access to the Cloud version of the product and I know for a fact that a good number of people have been eagerly anticipating this updated version of LTP. If you are a platinum monthly or annual subscriber, or you purchased a lifetime platinum membership in the past, the first thing we want to note is that you will get access to one of the LTP Cloud plans with no additional charge to your current plan. We just started rolling out to platinum users yesterday – we are doing so in batches of about 300 a day so that we don’t overload our servers. Everyone should hopefully be migrated by about the end of next week provided we don’t run into any server stability or slowdown issues. For non platinum Long Tail Pro users who don’t have access to our proprietary Keyword Competitiveness feature – Long Tail Pro Cloud will be available to you at a discounted rate. Long Tail Pro Cloud is equivalent to Long Tail Platinum, in that keyword competitiveness scores (as well as a couple of other features) are available to all users on the cloud platform. If you’ve seen the new homepage, you’ll notice that there is now a monthly keyword quota in Long Tail Pro Cloud. The reasoning behind this is we’re now paying for multiple third party data services (e.g the replacement data providers for Google Keyword planner data), and there is an ongoing monthly cost of each additional user. However, we’d like to note that this keyword quota only applies to the Cloud version, and any user who has access to the desktop version can continue using it. Also, we believe that the monthly keyword quotas are quite generous and most users are unlikely to run out of keywords. Every existing user who has the desktop application will continue to have access to the desktop application. For those of you who have Long Tail Pro without the Platinum edition, or just for those of you who prefer using the desktop version for other reasons, here is a potential solution for the ranged volume issue with Google Keyword Planner. On a somewhat related note, we realize that we have not communicated with our users as frequently as maybe we should have been. The LTP Team isn’t large, and all our focus has been on getting the Cloud tool to the point where we feel it is stable and reliable enough to release to users, which has unfortunately led to a little bit of oversight on the communication side with some of our users. We apologize for this, and we’re actually working on bringing in a new community manager to address this issue. Hopefully this post clears up most of the lingering questions about our plans for LTP Cloud. Q: Why wasn’t the Cloud version given to existing subscribers first? A: There are about 2000 active users of the existing Air application. This is a LOT of people to bring onto a new infrastructure all at once. In order to provide the best service and reliability to everyone, we chose to release the app to new signups first so that we could watch the system very carefully, fix any problems quickly, and provide the best experience to everyone when we send out your new accounts. We want your first experience with the web application to be a good one. Q: When will accounts be sent out to existing subscribers? A: We started rolling out accounts to existing users yesterday. We wanted to start sending them earlier, but were delayed by about two weeks while we waited on an external service provider to approve our usage increases. If all goes smoothly, existing platinum users should all have cloud accounts by the end of next week. Q: How much will the new application cost? Will you have to pay an additional subscription cost? A: For existing monthly or annual subscribers, there will be no additional cost. 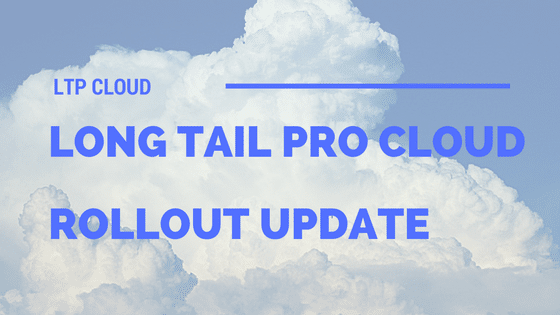 You will be subscribed to Long Tail Pro Cloud as a bonus in addition to continued access to the Air tool. Q: What about Platinum Lifetime users? A: Platinum Lifetime users will also get access to Long Tail Pro Cloud at no additional cost. Q: What about non-Platinum Long Tail Pro users? A: LTP users who are not lifetime platinum, monthly, or annual subscribers will not get automatic access to the Cloud version of the tool. We will however provide exclusive discounts to all existing non-platinum users, and non-platinum users can of course continue using the desktop version of the tool. For users who are running into the ranged volume issue with Google Keyword Planner, here is a potential solution to overcome this issue. Q: Why are there keyword limits? A: The web application is more expensive to operate. For one thing, there’s a lot more infrastructure to support, as well as the API subscriptions for services such as Majestic and a new service to provide accurate keyword volume so we can avoid the Google Keyword Planner account restrictions. Relying on external services rather than Ad Hoc user accounts makes the product more stable and reliable, but the costs associated with it are often usage based. We need a way to reliably estimate usage, so unlimited keywords simply aren’t feasible. We’ve already doubled the keyword limits on each of the new plans for LTP Cloud, and based on our own usage, we think that the keyword limits are reasonably generous and should not be an issue at all for the vast majority of our users.